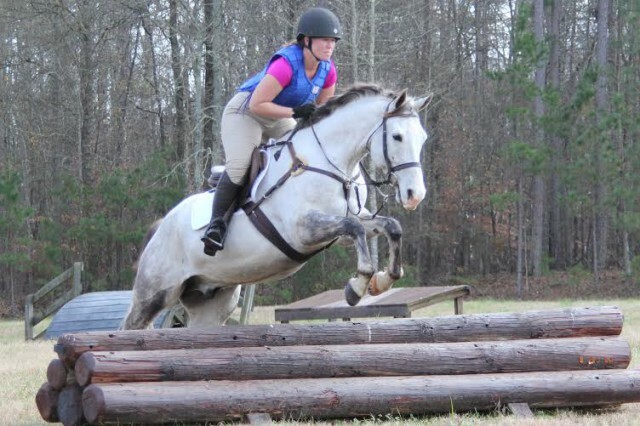 Christine Frye and her super mare, Callie, are looking to make their eventing debut in the spring of 2016. 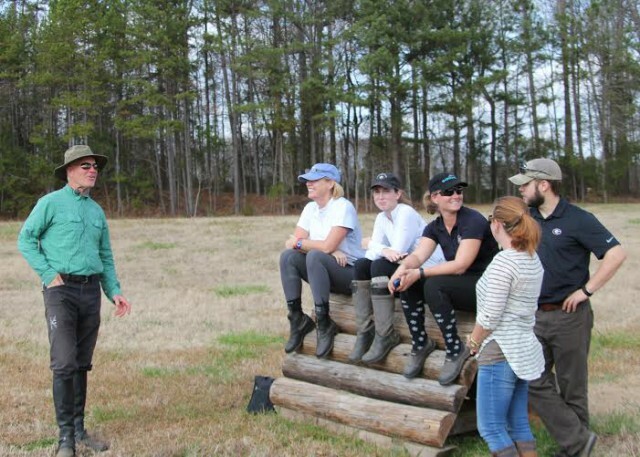 On December 12-13, 2015 they audited a Richard Lamb clinic hosted at their home base, Silverthorn Farm in Athens, Georgia. Inspired by what she saw, she wrote up her impressions to share with EN readers. Thanks, Christina! Photo courtesy of Van Kanavage. Richard Lamb recently visited Silverthorn Farm in Athens, Georgia to teach a weekend clinic for riders in the area. 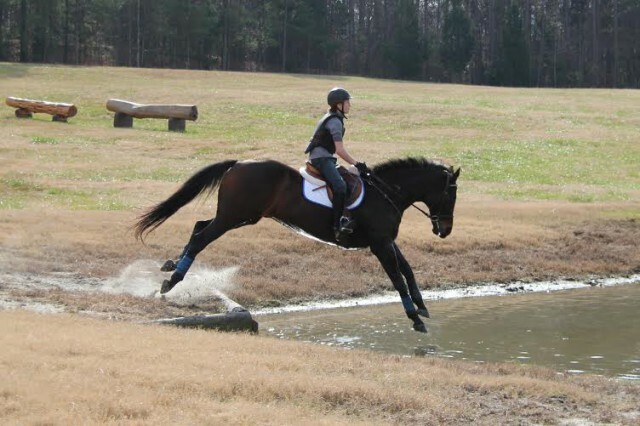 Riders had the choice of either cross country or show jumping focus for the clinic and with that, they were separated into four groups; Tadpole Show Jumping, BN/Novice Show Jumping, Tadpole/BN Cross Country, and BN/Novice Cross Country. Day one began with the first two show jumping groups. Both groups began their section of the clinic having a talk with Richard about their horse and what they strove to achieve at the clinic. After each rider was introduced, they began warming up by trotting and cantering over a circle of ground poles to help improve balance and to encourage each horse to think his feet. This exercise also helped riders focus on looking ahead instead of down, and to ride the rhythm instead of micro-managing the strides. After each rider felt happy with their pole work, they began working through a gymnastic. The gymnastic was composed of a bounce, to a one stride, to a bounce. 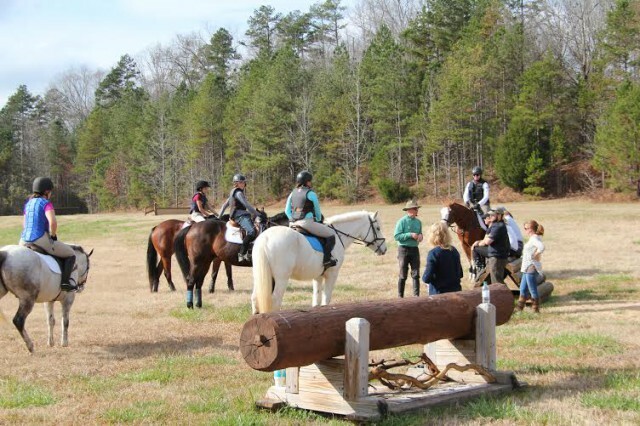 Richard encouraged riders from both groups to look up, breathe, keep their lower leg on, and have their hands up and forward; basic adjustments steps that may seem simple but are absolutely necessary for each rider to provide a balanced ride from start to finish. All horse and rider combinations remarked on the benefit of the aid adjustments and how much smoother their trips through the grid progressed as they solidified these concepts. Upon successful completion of the grid, Richard talked with each rider about their improvements for the day and what concepts they needed to focus on for the following day. Everyone was enthusiastic about the changes they had experienced in themselves and in their horses! After lunch break, the second half of day one began with the cross-country groups. Everyone was eager to improve their jumping in the ring before heading out on cross country the next day. Richard started off both groups the same as the morning groups, with a talk about the rider, their horse, and what they hoped to achieve. Once every rider explained their goals, they started off with a similar ground pole exercise on the flat. The BN/Novice group did a variation of the pole work which included adding leg yields at the trot and canter, both off the rail and back onto it. This exercise proved difficult but rewarding for a number of the horse and rider combinations, especially heading into the gymnastic portion of the lesson. Once every horse and rider felt successful on the flat, Richard introduced a “weaving” exercise. The exercise encouraged riders to keep both legs active to create a better connection through the outside rein. This created a more fluid and correct bend helping the horses go more smoothly forward through the turns and straight back down the gymnastic to finish the exercise. The weave consisted of three half cross-rails staggered so that upon angling into the exercise riders would then steer around a middle jump to get to the out. This exercise made many riders realize weakness in correct outside leg aids and an overreliance on the inside rein for steering. By the end, horses and riders were much more confident in conquering the weave by adding leg and without pulling. Once the weave portion was successful, riders then rode straight through the exercise which was a one stride in to the middle offset vertical to one stride out. Because the jumps were slightly offset, the rider’s leg aids were vital for keeping horses channeled through the narrow exercise. This again stressed the importance of solid leg aids and not relying on rein aids for guidance. Not every rider excelled at the beginning, each facing their own troubles, but with Richard’s guidance everyone finished on a positive note. Each rider left the ring excited to take on cross country the next day. Day two began with both show jumping groups reviewing their goals from the previous day. Each group started with a simple cross rail, trotting back and forth both ways, then cantering both ways. 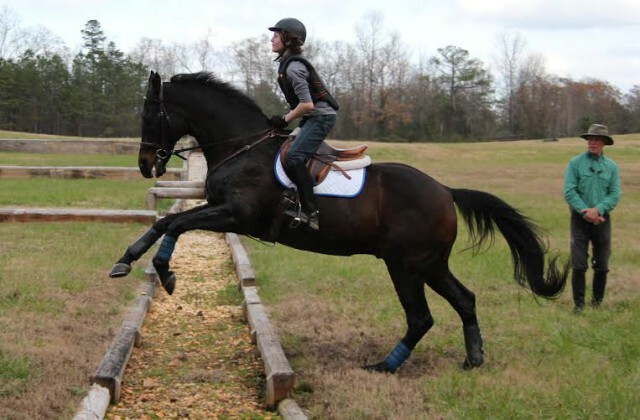 After every horse and rider pair perfected the single jump, focusing on rhythm and balance (singing or counting if they tried to override the jump) they began to work on courses. Richard’s recurring themes for the weekend were looking up, breathing, leg on and counting. 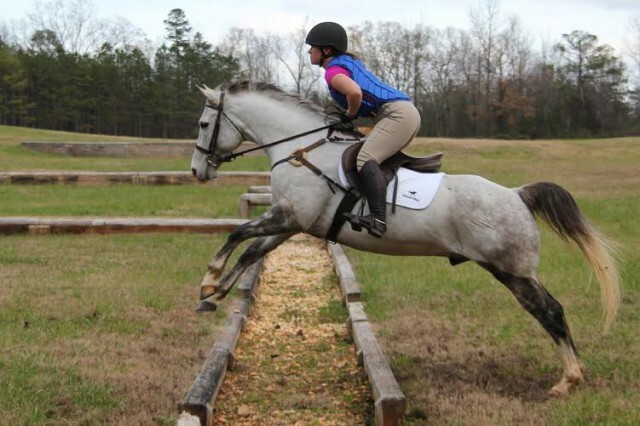 All of the riders were able to stay more focused on rhythm and letting their horse do the work when heeding these suggestions. The breathing plays a major role in any jumping exercise, as it allows you to gracefully and rhythmically approach a jump. 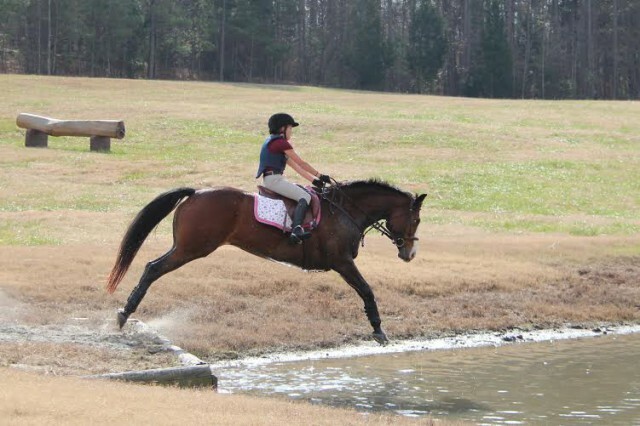 Holding your breath typically results in an awkward stride or jumping effort, and ultimately just interferes with the horse doing his job. A horse in the second group was unsure of the change in riding style, so Richard opted to mount up. In an effort to help the horse and rider both understand the concepts, he flatted the horse for a minute, emphasizing his hands up and giving forward, where the rider could visually see the improvement. Then, Richard took the horse through the same course as the riders had done with marked improvement after a couple trips through. Once the rider saw what to do and how her horse responded, she mounted back up. The rider again attempted the course, putting Richard’s methods to the test, and the improvement was incredible. Her smile said it all! After a successful two days, the show jumping riders were excited to work on their homework and hone their new found skills. Everyone seemed pleased with themselves and their horses and were eager to hear when Richard would be back. In the afternoon on Day two, both headed down the street to Cedar Ridge Farm for cross country. The Tadpole/BN group went first and discussed proper cross country positioning and how to regulate the horses speed and balance over terrain. They started at the water, walking initially to be sure each horse understood the question. After trotting and cantering through, riders began to string together small courses using the logs and log piles nearby. Eventually the group made it to the ditches and banks, where everyone discussed the proper position for going up and down banks as well as over ditches. The group left feeling successful and looking forward to working on their homework and making more improvements. The BN/Novice group was a mix of professional and amateur riders as well as experienced and green horses. This group started the same as the first, going over position for terrain and regulation of speed. Riders started through the water and quickly progressed to course work. Emphasis was on horse and rider understanding the questions; water/banks/ditches for the horses, and correct and effective positioning and its influence on the horse for the riders. After completing mini-courses, riders tackled the ditches and a half-coffin as well as the banks. There were vast improvements in confidence for both horses and riders after two days of hands up, look ahead, take a breath and ride the rhythm. The Richard Lamb clinic proved to be a great weekend for every rider who came out to participate. Everyone’s improvements throughout the weekend were clearly visible and it will be great to see what they can accomplish at future clinics. A big thank you to Richard Lamb for instructing such a wonderful clinic and to every rider, horse, and spectator who made it so much fun! Thank you also to Smartpak for donating goody bags for each participant and to Silverthorn Farm and Cedar Ridge Farm for use of their facilities!